"Rock of the Month # 31, posted for January 2004" --- Troctolite from the Eastern Layered Series (ELS) of the Tertiary igneous complex which forms the highlands of the southeast quadrant of the mountainous island of Rhum, in the Inner Hebrides of northwest Scotland. Above: fresh face. Below: weathered exterior face typical of hillside exposures. GCW Old Series sample 118.127, from Unit 9 of the ELS. Digital image, 07 April 2004. With 10-pence coin (24 mm diameter) for scale. Troctolite is a plutonic igneous rock composed of essential olivine and plagioclase feldspar. In mineralogical terms it is intermediate between anorthosite (feldspar-dominant) and peridotite or dunite (olivine-dominant) lithologies. 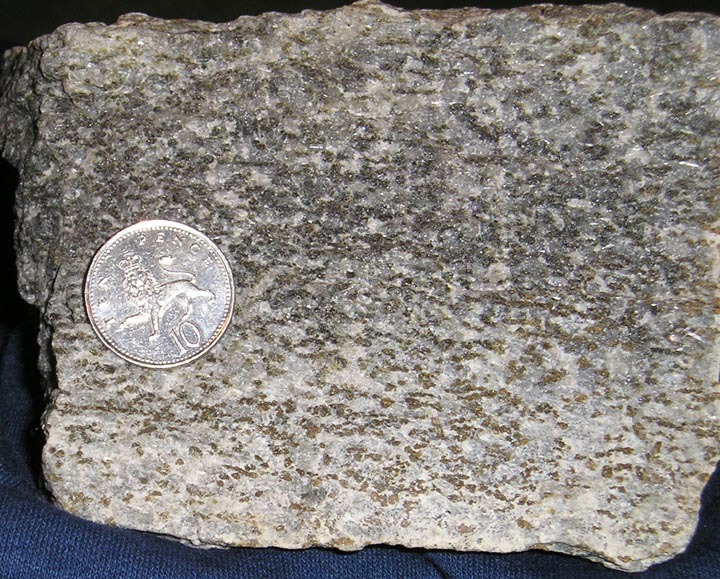 These rocks and their relatives, composed of differing proportions of essential olivine, clinopyroxene, orthopyroxene and plagioclase, are generally much enriched in magnesium and iron and depleted in silica relative to the more-familiar granites. The figured sample, seen in fresh-broken and weathered faces, is from the Rhum (Rum) layered intrusion, a textbook classic example of a layer-cake of genetically-related igneous rocks formed in a magma chamber within the crust, during the birth of the North Atlantic Ocean in Paleocene time, some 60 million years ago. With much more feldspar than olivine, it is technically a leucotroctolite, and the local name (after one of the Rhum mountains where it occurs so prominently) is allivalite. The igneous rocks of the Tertiary intrusive complex of central and southern Rhum have received considerable academic attention, most notably as one of the classic localities in which was tested the concept of gravitational settling in a magma chamber, to form layered suites of mineralogically distinct compositions known as cumulates (Wager et al., 1960; Wager and Brown, 1968). Geophysics suggests that the complex is the apex of a column of mafic magma circa 15 km in vertical extent (Emeleus, 1987). The Rhum central complex has been dated at 58.4 +/- 0.8 Ma, the associated volcanic pile at 60.1 +/- 1.0 Ma (Mussett, 1984). Numerous pulses of magma appear to have been emplaced, to fractionate and consolidate within the magma chamber. The exposed rocks have been divided into some 16 major layers, typified by a peridotite basal zone and an overlying troctolite. The layers are numbered from the base to the mountain summits, and the numbering system was in vogue by the late 1970s, with articles describing the basal units 1-5, 7, and in particular units 9-14. Some replacement of allivalite during lateral migration of peridotite. Alteration in a cooling regime, affecting peridotites at higher temperatures than overlying troctolites, as indicated by the Fe-Ti oxides and thus in the magnetic properties (Housden et al., 1996). The parental magma of the peridotites was identified as an olivine tholeiite (Greenwood et al., 1990) by examination of chilled margins of the intrusion. Isotopic studies, notably of units 9 and 10, have demonstrated mixing of successive batches of magma, and a degree of contamination of magma by the wallrocks, which include Lewisian gneisses and younger Torridonian sediments (Palacz, 1984, 1985). Crystal growth proceeded in a dynamic environment as the parental magmas interacted with their surroundings (e.g., Tepley and Davidson, 2003). The host rocks of the circa 30 km2 intrusive complex, notably sandstones of Torridonian age, have also been studied, albeit to a much lesser extent, in terms of their deformation and localized partial melting (cf. Harker, 1932; Holness and Isherwood, 2003). Encouraged in large measure by successful analyses of meteorites, new analytical techniques have permitted ever more detailed analyses of minerals within rocks. Rhum rocks have been compared with meteorites in ion microprobe (SIMS) analyses of nickel in olivines (Reed et al., 1979). With the exceptions of thin layers and outlying minor intrusions, mentioned in the next section, the rocks of the Rhum igneous complex tend to be sulphide-poor and unmineralized. Precious- metal values (gold, silver and platinum-group elements, PGE) are correspondingly low. Rhum samples featured in several early studies of high-sensitivity analysis of precious metals in silicate rocks. Neutron activation methods are especially sensitive to gold and iridium. 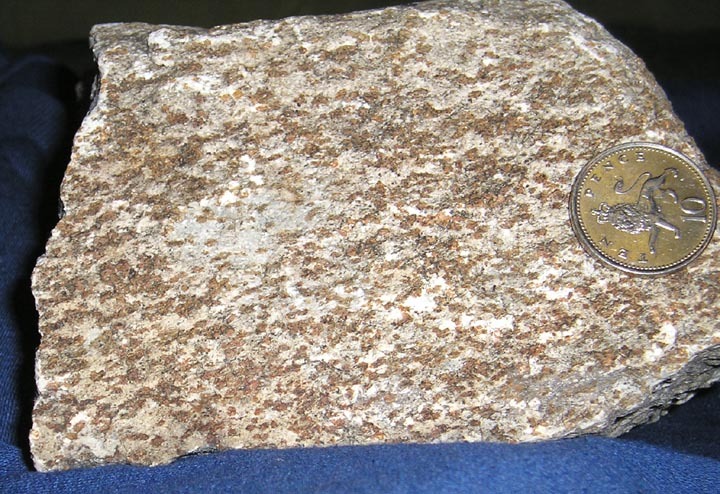 Terrestrial rocks were found to be much depleted in precious metals as compared to meteorites. A gold content of 11 ppb was determined for an olivine cumulate from Rhum (Vincent and Crocket, 1960). Detailed analyses of mineral separates from Rhum included mean Ir contents of plagioclase, clinopyroxene and olivine of 0.06, 0.075 and 0.35 ppb respectively, with the value for pure olivine estimated at approximately 0.07 ppb (Gijbels et al., 1976). This study concluded that the Ir content of Rhum magma may be 2 orders of magnitude below that of Bushveld magmas, and `the data are consistent with frequent magma pulses of constant composition into a magma chamber'. Contemporary work suggested that olivine may concentrate Ir, although much of the PGE might lie not in the silicate host but in small chromite inclusions (Crocket, 1979). Subsequent work has confirmed that PGE are fractionated between rock-forming minerals and parental basaltic melts, e.g., Rh and Ru are compatible in olivine, whereas Pd is strongly excluded (Brenan et al., 2002). Analysis of oxide phases in mafic intrusions (Parry, 1984) suggested that ilmenites from Rhum and Bushveld are enriched in Pt relative to other PGE. The least mobile of the PGE (e.g., Ir) may be most evenly distributed amongst oxide grains, while Pd, Pt and Au may be deposited on grain boundaries. The Rhum layered intrusion shows very limited development of obvious economic mineralization, compared with larger layered mafic complexes such as the Bushveld of South Africa or the Great Dyke of Zimbabwe. However, a very thin (cm-scale) chromite cumulate is developed at the junction of units 11 and 12, and base-metal sulphides do occur in and above this chromitite (Dunham and Wilkinson, 1985). The unit contains complex Fe-Ti-Cr oxides, and values of Ni and Cu, Ag and Au. Thin, impersistent chromitites occur at the boundaries between other units or, more rarely, within individual units. Small sulphide grains (typically <0.1 mm) occur in the chromitites, with precious-metal phases such as electrum, laurite, sperrylite, keithconnite and moncheite (Andersen et al., 2002). Small satellite plus and tongue-like apophyses of peridotites exist beyond the main igneous complex. Mineral chemistry is generally similar to the cumulates of the layered complex, and the smaller bodies appear to be conduits from the main subvolcanic magma chamber (Wadsworth, 1994). Recent study of the West Sgaorishal ultramafic plug has documented a 2-stage paragenesis of mineralization, with disseminated Cu Ni sulphides with Pd-Bi-Te- (Pt,Ag) minerals around the margins of the plug, locally exceeding 400 ppb total PGE+Au, plus later sulphide-rich dykes where grades may reach 2,000 ppb or more (Power et al., 2003). Flat chondrite-normalized PGE patterns indicate a primitive, mantle-derived magma, while negative S isotope ratios suggest crustal contamination, probably by Jurassic sediments. Andersen,JCO, Power,MR and Momme,P (2002) Platinum-group elements in the Palaeogene north Atlantic igneous province. In `The Geology, Geochemistry, Mineralogy and Mineral Beneficiation of Platinum-Group Elements' (Cabri,LJ editor), CIM Spec.Vol. 54, 852pp., 637-667. Brenan,JM, Dalpe,C and McDonough,WF (2002) PGEs are fractionated by olivine-melt partitioning. Abs. 12th Annual V.M. Goldschmidt Conference, Davos, GCA 66 no.15A, A103. Crocket,JH (1979) Platinum-group elements in mafic and ultramafic rocks:a summary. Can.Mineral. 17, 391-402. Dunham,AC and Wilkinson,FCF (1985) Sulphide droplets and the unit 11/12 chromite band, Rhum: a mineralogical study. Geol.Mag. 122, 539-548. Emeleus,CH (1987) The Rhum layered complex, Inner Hebrides, Scotland. In `Origins of Igneous Layering' (Parsons,I editor), D. Reidel Publishing Company, 666pp., 263-286. Gijbels,R, Henderson,P and Zels,J (1976) Geochemistry of some trace elements in mineral separates from Rhum, Inner Hebrides, with special emphasis on iridium. Econ.Geol. 71, 1364-1370. Greenwood,RC, Donaldson,CH and Emeleus,CH (1990) The contact zone of the Rhum ultrabasic intrusion: evidence of peridotite formation from magnesian magmas. JGSL 147, 209-212. Harker,A (1932) Metamorphism, a Study of the Transformations of Rock-Masses. Methuen & Co. Ltd., London, 1st edition, 360pp. Holness,MB and Isherwood,CE (2003) The aureole of the Rum Tertiary igneous complex, Scotland. JGSL 160, 15-27. Housden,J, O'Reilly,W and Day,SJ (1996) Variations in magnetic properties of Unit 10, Eastern Layered Intrusion, Isle of Rum, Scotland: implications for patterns of high temperature hydrothermal alteration. Trans.Roy.Soc.Edinburgh: Earth Sciences 86, 91-112. Mussett,AE (1984) Time and duration of Tertiary igneous activity of Rhum and adjacent areas. Scot.J.Geol. 20, 273-279. Palacz,ZA (1985) Sr-Nd-Pb isotopic evidence for crustal contamination in the Rhum intrusion. EPSL 74, 35-44. Palacz,ZA (1984) Isotopic and geochemical evidence for the evolution of a cyclic unit in the Rhum intrusion, north-west Scotland. Nature 307, 618-620. Parry,SJ (1984) Abundance and distribution of palladium, platinum, iridium and gold in some oxide minerals. Chem.Geol. 43, 115-125. Power,MR, Pirrie,D and Andersen,JCO (2003) Diversity of platinum-group element mineralization styles in the North Atlantic igneous province: new evidence from Rum, UK. Geol.Mag. 140, 499-512. Reed,SJB, Scott,ERD and Long,JVP (1979) Ion microprobe analysis of olivine in pallasite meteorites for nickel. EPSL 43, 5-12. Tepley,FJ and Davidson,JP (2003) Mineral-scale Sr-isotope constraints on magma evolution and chamber dynamics in the Rum layered intrusion, Scotland. Contrib.Mineral.Petrol. 145, 628-641. Vincent,EA and Crocket,JH (1960) Studies in the geochemistry of gold - II. The gold content of some basic and ultrabasic rocks and stone meteorites. GCA 18, 143-148. Wadsworth,WJ (1994) The peridotite plugs of northern Rum. Scot.J.Geol. 30, 167-174. Wager,LR and Brown,GM (1968) Layered Igneous Rocks. Oliver and Boyd, 588pp. Wager,LR, Brown,GM and Wadsworth,WJ (1960) Types of igneous cumulates. J.Petrol. 1, 73-85. Young,IM and Donaldson,CH (1985) Formation of granular-textured layers and laminae within the Rhum crystal pile. Geol.Mag. 122 no.5, 519-528. Visit the Turnstone "Rock of the Month" Archives!